Four out of five homes in the United States have asphalt roofing, for good reason. Plentiful and cheap, they are relatively easy to install and maintain. Asphalt roofing lasts around 15 to 30 years, depending on your local climate, roof pitch and the quality of the asphalt shingles you choose. Asphalt roofing has the lowest initial installation cost of any kind of roofing, and comes in almost any color. 3-tab asphalt shingles are cut in such a manner that each individual shingle looks like three separate pieces once installed. They create an asphalt roof with a flat appearance. They are suitable for high-sloped roofs. Architectural asphalt shingles have additional layers of asphalt laminated on the lower portion, giving a contoured and dimensional look. Architectural asphalt roofs are generally longer lasting than 3-tab. They are thicker and, since there are no tabs, they are less likely to be lifted up by the wind. Asphalt shingles consist of a base material covered with a layer of asphalt or modified bitumen, and topped with mineral granules. Organic asphalt shingles have nothing to do with being environmentally friendly. They are still the same petroleum based shingles that have been used for decades. The difference is that the base layer is composed of a non-synthetic material such as wool, cotton or cellulose that is soaked in asphalt to make it waterproof. Organic asphalt roofing is heavier and thicker than fiberglass shingles due to the additional asphalt content, and therefore less environmentally friendly. They are considered to be more flexible and rugged than fiberglass. 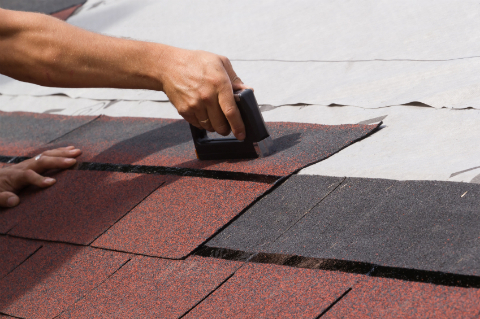 Fiberglass asphalt shingles began to be manufactured in the 1980’s. Their base is made of woven fiberglass, which is coated with asphalt. Fiberglass asphalt roofs are lighter and thinner than organic due to the difference in asphalt content. Fiberglass asphalt shingles usually come with a longer warranty and a higher fire safety rating. The layer of fiberglass means that they absorb less moisture and are more heat resistant, which makes them more suitable for warmer climates. Energy Star certified asphalt shingles are now available. They are created with special “cooling granules” that reflect and emit the sun’s heat back into the sky rather than into your home. Asphalt roofs created with these shingles may qualify for a tax credit. The most important thing with any type of roofing is to opt for quality over economy. If you choose high quality asphalt shingles and have them properly installed by a qualified asphalt roofing contractor, the longer your roof will last (and the likelihood of damaged asphalt roofs being covered by an insurance claim will be much higher.) Poorly installed asphalt roofing could mean that you need to replace your roof in just a few years.